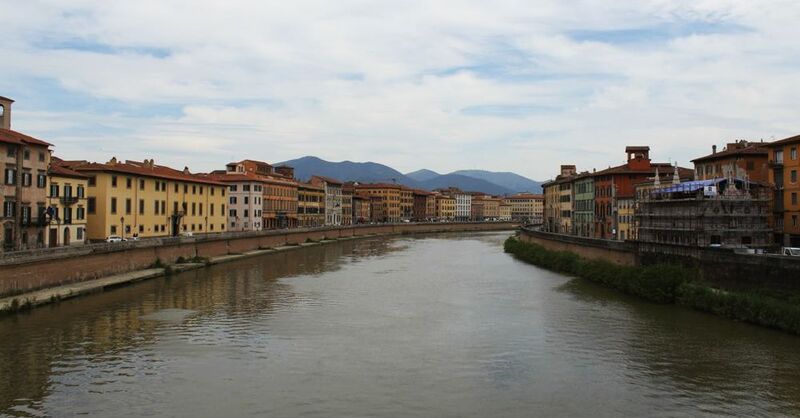 We chose to stay in Lucca because of its proximity to both Pisa and Florence, and on this particular morning we decided to drive to Pisa to visit the UNESCO World Heritage Site known as the Piazza del Duomo, Pisa. Maria, our host at Principe Calaf B&B suggested we leave our car parked at the B&B and take a bus to Pisa. And while that was a great suggestion, we'd had our fill of day-trips via bus, so we opted to make the short drive instead. We jumped into Persephone and headed off to Pisa. it was a short drive, only about 30 minutes, and after a little effort we found a parking spot along the banks of the River Arno. Then we started walking, following the signs to the tower. It wasn't a hard thing to find. 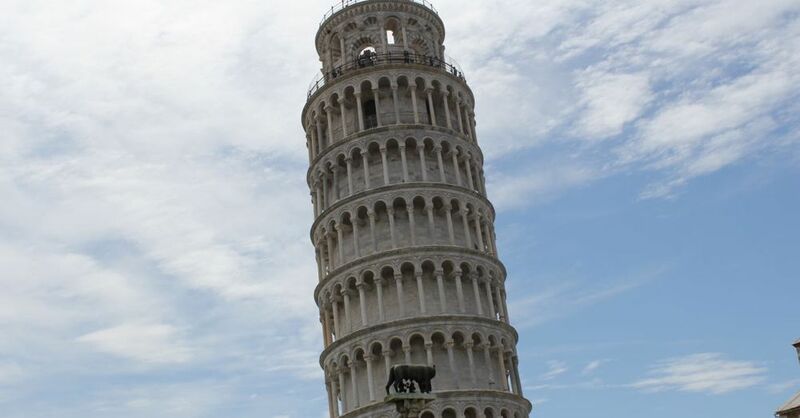 Does anyone see a leaning tower around here? As we got closer to the tower, the streets started to fill up with other visitors to Pisa and a great many street vendors selling all sorts of cheap trinkets—like the ever-present selfie-sticks—but mostly metal casts of the Tower of Pisa on keychains. 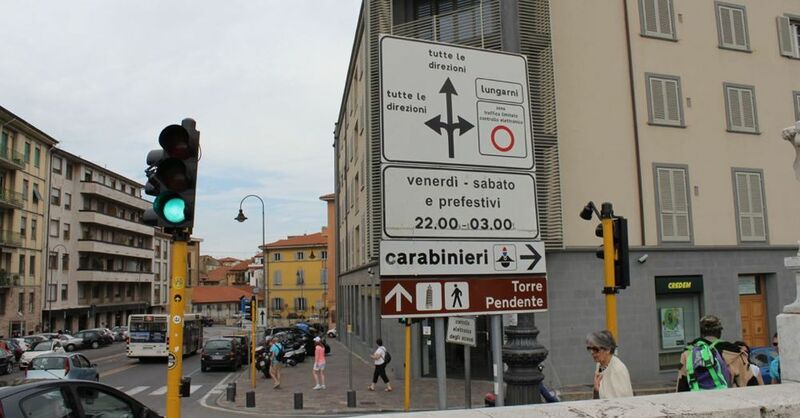 It wasn't long before we stood in Pisa's Cathedral Square where the Leaning Tower is located. 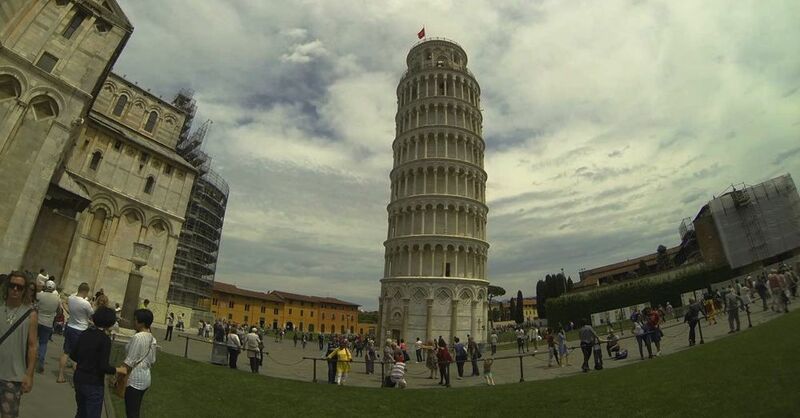 And it's not called the leaning tower for nothing—it tilts at 3.99 degrees off its axis. 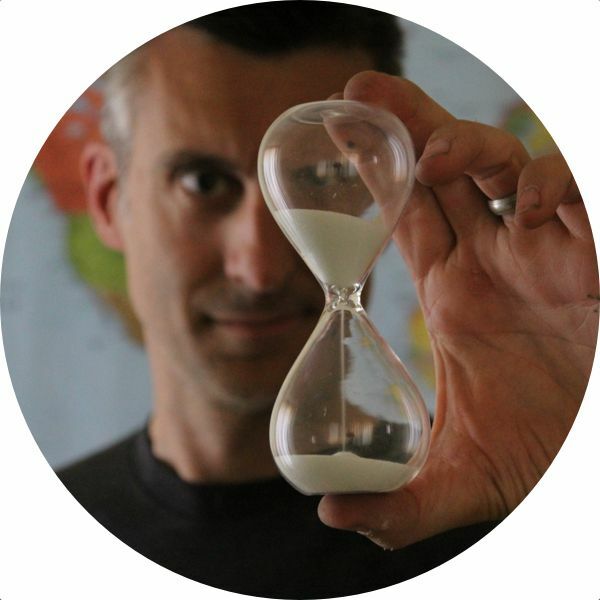 It used to tilt at a much greater 5.5 degrees, but it's been stabilized in recent years. But what is the tower? 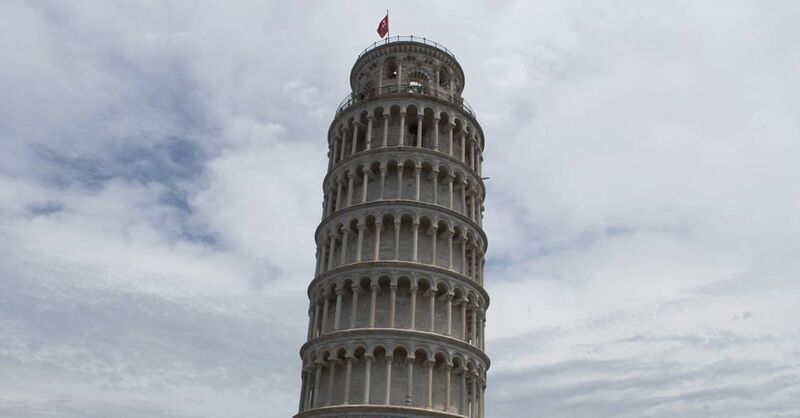 This isn't just a UNESCO site because it's a famous tower that leans. 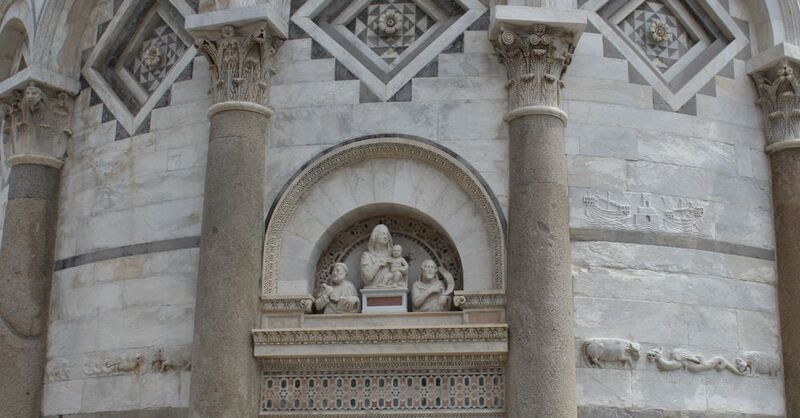 The whole area carries the name of Piazza del Duomo (Cathedral Square), and the leaning tower is the bell tower for the Cathedral of Pisa, which stands right next to the tower. But the Cathedral is all but overlooked by the most tourists, who just come here to see the tower. Looking at the tower is free, but if you want to climb it, it'll cost you €18. We opted not to climb, partly because of the expense and partly because climbing towers had gotten to be a little routine (the curse of the long-term traveler). Above the doorway to the steps up the Tower. The ground in front of the nearby Cathedral is consecrated ground, so you're not supposed to walk on the grass. The help prevent people from accidentally walking on the grass, the area is surrounded by a chain that's supposed to keep people out. But plenty of people step over the chain and walk on the sacred ground to get a better angle for their forced-perspective shots of them pushing the tower over. So the air is often filled with the sharp squeal of whistles and guards yelling at tourists to get off the grass. Romulus, Remus, and the Tower. But the grass on the other side of the tower, next to the iconic statue of Romulus and Remus (the mythical founders of Roma) sucking form a she-wolf, is fair game for lounging upon and when we were there, many people were doing so. After we checked out the tower (and gift shop), we were hungry. So we grabbed a bad meal at a nearby tourist trap restaurant and then re-traced out steps back to the car. 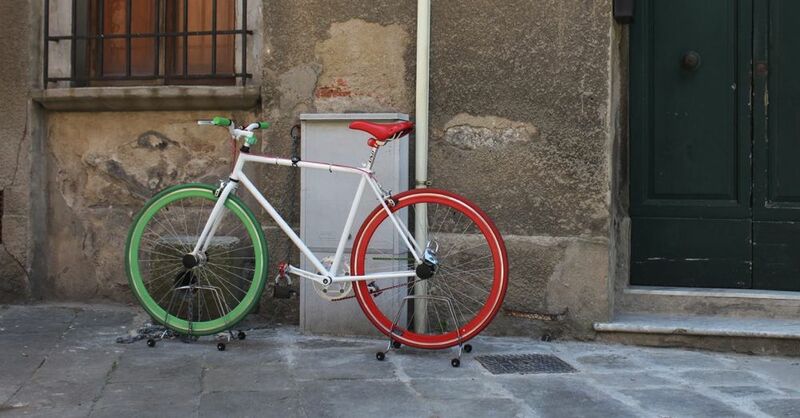 Our short trip to Pisa was over. As much as we like having our own car, we sometimes feel a little trapped by it. 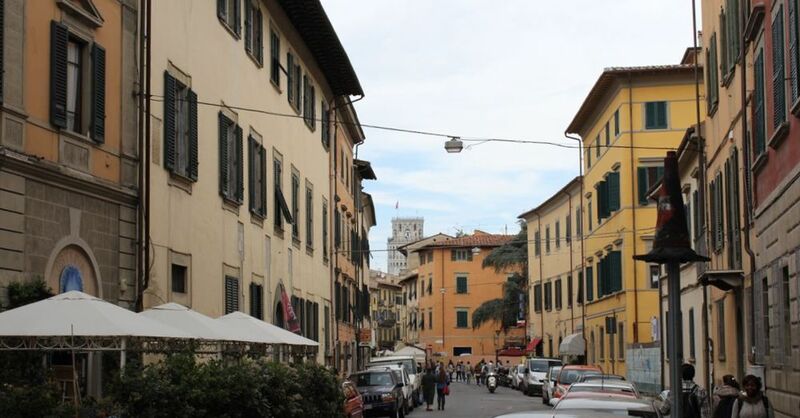 For instance, our metered parking spot in Pisa was running out quickly, so rather than explore the town a little more, we got into Persephone and headed back to our hotel and Lucca, where we went in search of ice cream.